For what seems like the past decade or so, I’ve been living with a kitchen remodel. Cooking while my kitchen was torn apart was not really a problem. I have an electric frying pan, an Instant Pot, and an Aroma Rice Cooker/Slow Cooker. I set them up in the dining room, creating a functional kitchen annex. But without running water (or a sink) plus some concurrent remodeling of the (very old) plumbing in the bathroom, clean-up was a challenge. While I started out cheerfully cooking up black beans and quinoa in the Instant Pot and rice cooker, my cuisine quickly morphed into whatever could be made in the microwave and toaster and served up on a paper plate. Yes, there has been a lot (a lot!) of peanut butter on toast in my menus. But I’ve also managed to pull together some pretty decent hot dinners. In addition to the obvious canned beans and veggie meats, these are some of the foods that made it possible for me to eat healthfully when I couldn’t cook. Frozen vegetables. In particular, the “steam in the bag” type veggies which included broccoli, kale, barbecued corn, sweet potatoes, and Brussel sprouts. Maybe not quite as tasty as fresh veggies (although the barbecued corn was pretty great) but not at all bad when you top them with a dollop of hummus or a drizzle of tahini sauce. And yes, perfectly healthy. In fact, frozen vegetables can sometimes be more nutritious than fresh. Frozen cooked brown rice. This also cooks up right in the bag. Steamables. Fresh little sweet and white potatoes that can be microwaved in the bag. I ate a lot of these. Instant Tabouli. Pour boiling water over it, add a can of chickpeas and voila—dinner. Instant Black Beans. I have to say that any excuse to eat Fantastic Foods brand Black Bean Mix is okay with me. I don’t know why I love them so much, but it has long been one of my favorite foods on earth. Their refried beans are good, too. Tasty Bite Entrees. 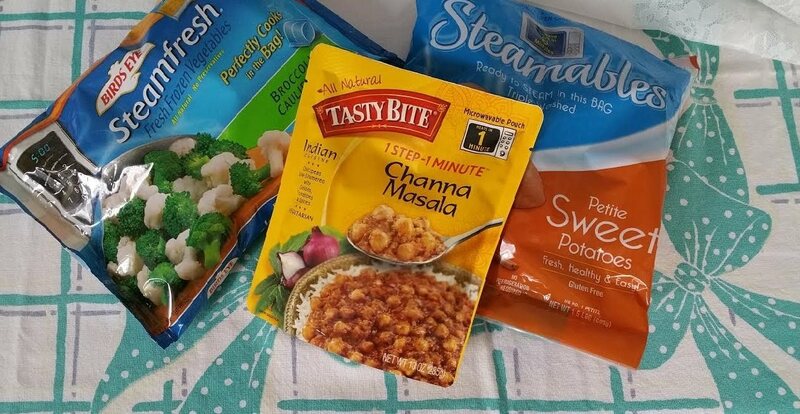 Packaged in microwavable pouches, some of these are vegan and are available at warehouse stores like Costco and BJs. They’re high in sodium, so I used them more condiment-style over rice and veggies. Salad from a bag with Follow Your Heart or Daiya dressings. Baked Tofu. Teriyaki or ginger-flavored and ready to eat right out of the package. Peanut butter. When all else fails, there is peanut butter or almond butter—packed with protein, fiber and healthy fats, these are almost perfect foods in my opinion. Spread them on apple slices or toast, or thin with water and drizzle over cooked vegetables. This style of food prep definitely has its down side. For one thing, it costs a little bit more than what I normally spend on food (although it’s been way less expensive than going out to eat, which is something I rarely do). And there was the discomfort I felt about all of the wasteful packaging. On the upside, though, during a fairly challenging and stressful time in my life, I had some reasonably tasty meals. And, my diet was healthy. Beans, brown rice, salad, collards, corn, peanut butter, whole grain bread, guacamole, oranges, apples, extra-virgin olive oil—it’s hard to imagine a healthier way of eating. I also learned a lot about options for non-cooks. 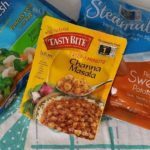 I’ve been impressed with how easy it’s been to “cook” up meals that are healthy and appealing with just a microwave oven, an electric tea kettle, and a toaster. And my groceries all came from a local market—which is not some fancy schmancy Whole Foods kind of store. While I wouldn’t recommend building an entire diet around these foods—again, mostly because of cost and packaging—they provide options for those who are trying to be vegan in an imperfect world. Even people who enjoy cooking are likely to have days when they don’t have the time or energy to do so. So, there is something to celebrate about this kind of food—namely that it means that vegan food is available to everyone. Good points! Good luck with the remodeling. As I read this I am at the end of a 5 day stay in a hotel for a business trip. I have relied on the microwave & fridge in my room to cook oatmeal sweet potatoes and steam in the bag veggies. I had sandwiches with hummus or pb, salad mixes & fresh fruit for lunch & snacks. One can eat well by keeping things simple & planning ahead. This was a super helpful post. 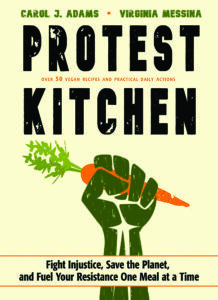 I know a lot of people interested in eating more plant based but don’t have much in the way of cooking skills. I think the meals you mention would really help people out that are transitioning. We did a kitchen remodel too. We had a microwave and a high speed blender and kept frozen/fresh produce in a cooler that was kept in an unheated screened porch (the remodel was in February 2010). We washed our dishes in the tubs by the washing machine. I made a lot of green smoothies, protein smoothies and raw soups, and made a lot of foods that could be heated up in bags in the microwave, as you describe. It wasn’t too bad, but I was very glad to have a functioning kitchen again. I agree with Tracey–your post is very helpful for people who are just starting out in the plant-based world and don’t have a lot of cooking skills or just have little desire to spend a lot of time in the kitchen. Ginny, I wonder what you think of the Amy’s Organic line of frozen dinners, many of which are vegan, and very tasty! Yes, I’ve had them and they’re good. If I was just feeding myself, I would have sprung for some options like that! Since it was my husband, too, those kinds of dinners just got too pricey. 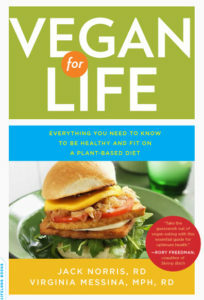 Thank you so much for this, and for your generally very livable approach to healthful vegan eating. 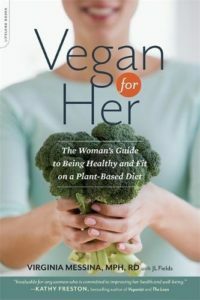 As someone who can cook but is often pressed for time, with a spouse who cannot cook, I appreciate both the recognition of and the guidance for a healthy, balanced, vegan diet that doesn’t look like a commercial for Whole Foods. vegan ramen packets can be doctored up with the baked tofu, veggies and the peanut butter you mentioned. 🙂 it is an easy meal. i am a fan of flour tortillas spread with hummus and pan fried. they go good with a side salad. toast with cookie butter gets me through crap times. You might consider picking up a slow cooker, with disposable liners for the bowl and foil covering the lid, there is no cleanup. Lots of things can be cooked in a slow cooker. Since I don’t like to eat a lot of junk, I had to really think about what I was doing. Well, guess what, it doesn’t take much to eat healthy. I have two cookbooks which are gems. One is The 4 Ingredient Vegan, and the other is the PETA College Cookbook. Maybe mentioning these books will help others. I should mention that the PETA College cookbook is now in its second printing, and the revised recipes are far superior to the first edition. It’s been about 40 years since I’ve graduated from college, but this book is absolutely fantastic for those who want easy, minimal cooking recipes. These two books alone, gave me so many ideas and became a platform for my own simple, easy recipes that require minimal time. 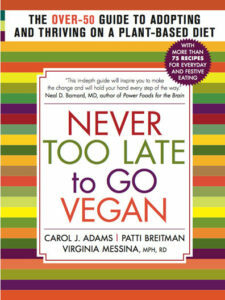 A few years ago I read in one of Dr. Neal Barnard’s books that he doesn’t like to cook either! I’m in good company! Thank you so much for acknowledging those of us who are either done with cooking, after a lifetime of doing so, and just want simple and easy. Hey! a new book from you maybe? In this day and age, folks just don’t have the time/energy anymore, retired or not. 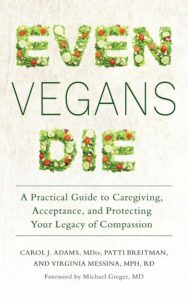 Thank you for all you have done helping me transition to veganism over the years. Good luck with the remodeling! Around here, we call Whole Foods the Whole Paycheck store. I am going through this right now! I’m only about five months into the vegan diet and have been obsessed with cooking/experimenting with vegan recipes up until this past month when my kitchen was ripped apart. Clean up in my bathroom sink is a nightmare! My go to meals have been rice (in my rice cooker), frozen veggies, and lots of romaine and kale salads. Those tasty bites have been a godsend for the days I’m running late to work though. So nice to read this article just to know I’m not alone. I want my kitchen back! I recommend cashew butter instead of Peanut butter because according to nutrituiondata.com it’s a more complete source of protein.